What do sugar skulls, marigolds and monarch butterflies have in common? Just like pumpkins, witches and black cats are quintessential symbols of Halloween, these objects are associated with a different holiday: Día de los Muertos, or Day of the Dead. While Halloween is celebrated Oct. 31, Día de los Muertos is celebrated right after, on Nov. 2. Many communities that celebrate Día de los Muertos also celebrate Halloween. Día de los Muertos originated in ancient Mesoamerica (Mexico and northern Central America) where indigenous groups, including Aztec, Maya and Toltec, had specific times when they commemorated their loved ones who had passed away. Certain months were dedicated to remembering the departed, based on whether the deceased was an adult or a child. After the arrival of the Spanish, this ritual of commemorating the dead was intertwined with two Spanish holidays: All Saints Day (Nov. 1) and All Soul’s Day (Nov. 2). Día de los Muertos is often celebrated on Nov. 1 as a day to remember children who have passed away, and on Nov. 2 to honor adults. Today, Día de los Muertos is celebrated mostly in Mexico and some parts of Central and South America. Recently it has become increasingly popular among Latino communities abroad, including in the United States. Ancient Mesoamericans believed that death was part of the journey of life. Rather than death ending life, they believed that new life came from death. This cycle is often associated with the cyclical nature of agriculture, whereby crops grow from the ground where the last crop lies buried. 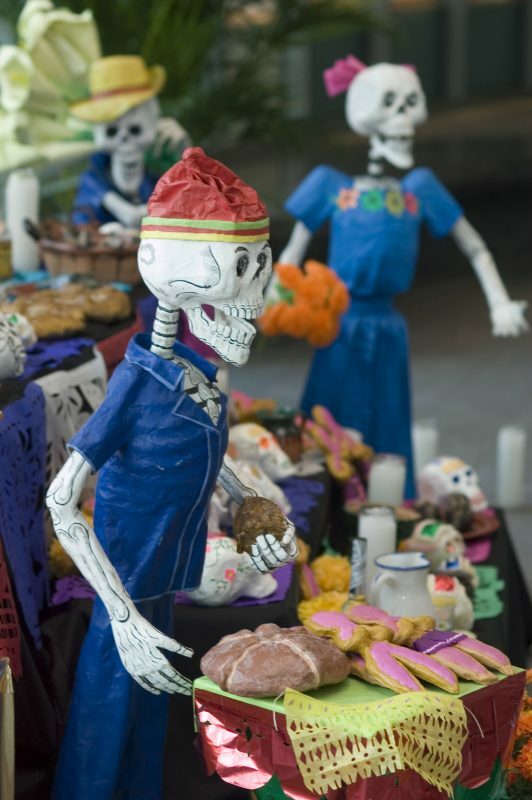 Día de los Muertos is an opportunity to remember and celebrate the lives of departed loved ones. Like any other celebration, Día de los Muertos is filled with music and dancing. 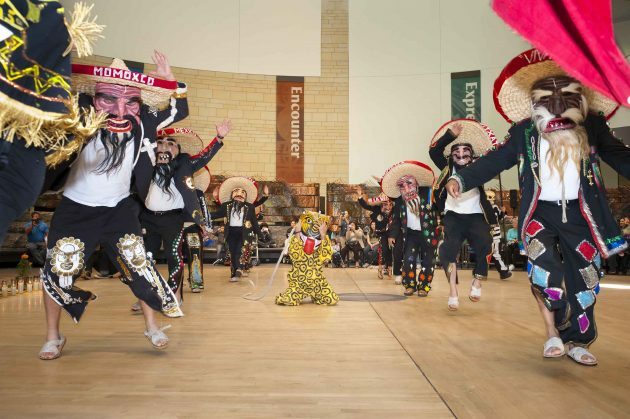 Some popular dances include La Danza de los Viejitos—the dance of the little old men—in which boys and young men dress as old men, walk around crouched over then suddenly jump up in an energetic dance. Another dance is La Danza de los Tecuanes—the dance of the jaguars—that depicts farm workers hunting a jaguar. The ofrenda is often the most recognized symbol of Día de los Muertos. This temporary altar is a way for families to honor their loved ones and provide them what they need on their journey. 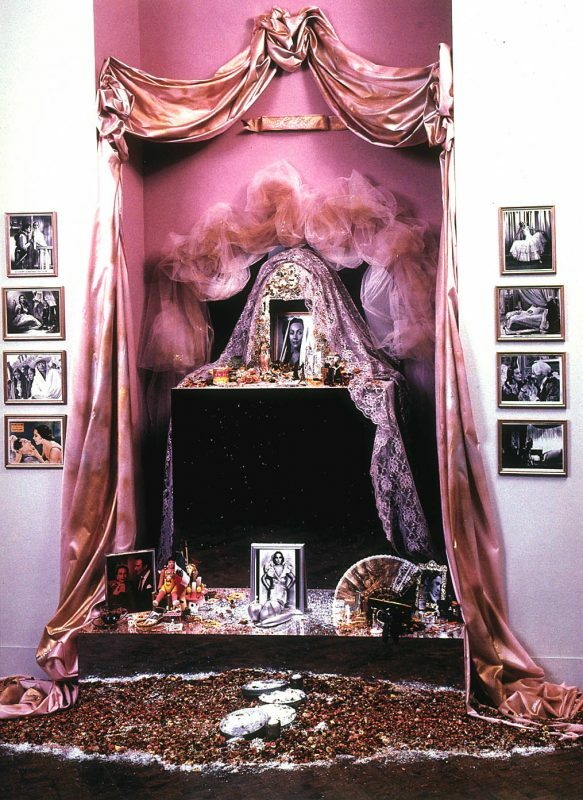 They place down pictures of the deceased, along with items that belonged to them and objects that serve as a reminder of their lives. 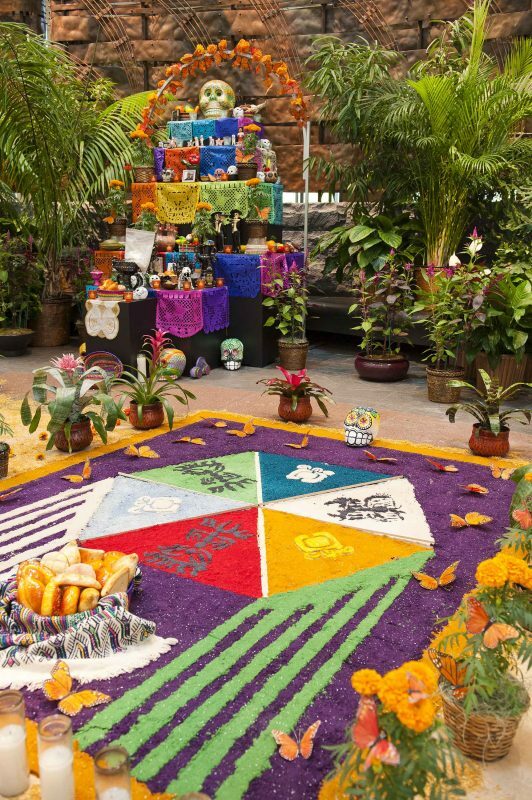 Every ofrenda also includes the four elements: water, wind, earth and fire. Water is left in a pitcher so the spirits can quench their thirst. Papel picado, or traditional paper banners, represent the wind. Earth is represented by food, especially bread. Candles are often left in the form of a cross to represent the cardinal directions, so the spirits can find their way. The cempasúchil, a type of marigold flower native to Mexico, is often placed on ofrendas and around graves. With their strong scent and vibrant color the petals are used to make a path that leads the spirits from the cemetery to their families’ homes. Monarch butterflies play a role in Día de los Muertos because they are believed to hold the spirits of the departed. This belief stems from the fact that the first monarchs arrive in Mexico for the winter each fall on Nov. 1, which coincides with Día de los Muertos. Calaveritas de azucar, or sugar skulls, along with toys, are left on the altars for children who have passed. The skull is used not as morbid symbol but rather as a whimsical reminder of the cyclicality of life, which is why they are brightly decorated. Learn more about Día de los Muertos click this link to visit the Smithsonian Latino Center’s Latino Virtual Museum.